The float festival was originated in the 17th century by king Tirumala Nayaka who reigned in Madurai. The local story is that the king had a new palace built and to make bricks for it, a great excavation was made. Later, he converted the excavated depression into a sixteen acre lake, fed the same by the Vaigai river through underground channels and built the temple of Ganesha on the artificial island in the middle. Then he started the custom of taking the divine idols for a boat ride on the waters of the lake on his birthday. Generally, this festival is celebrated during January of the year beginning with Sankranthi (Pongal) festival. At dawn, the processional idols of Meenakshi and Sundareshwarar start out from the main temple in great pomp. The deities are carried in golden palanquins escorted by elephants, horses, musicians and thousands of devotees. After reaching the Teppakolam, about three kilometres away, the deities are placed in a prepared 'Mandapam' on the banks of the lake, where the devotees are allowed to worship them. The idols are then taken in palanquins and placed on a great raft-like structure, colourfully decorated with varieties of flower garlands, silken buntings, paper lanterns and masses of flowers. Hundreds of devotees catch hold of the two big ropes by which the float is drawn and they await the signal to start. One rope is pulled by men standing on the central island and second by those on the bank of the lake. After the final ritual of worship the priests give the signal and the men strain at the ropes. Slowly, the great float moves away from the shore and begins its circuit. As the men on the rope run along the bank of Teppakulam the thousands of spectators crowding there enjoy by shouting the names of the deities in great joy. The float itself moves around the lake at a slow, steady pace. After a couple of rounds, which take more than three hours, the ornamental raft is moved to the central island and remains there till the evening. All through the day, a number of boats ply to the island bringing thousands of devotees to worship. The scene in the evening is even more wonderful and over a lakh of people gather to watch the procession. As dusk falls, all the five towers of the island temple glow with coloured light illumination. And thousands of little oil-lamps are lighted in the niches of the walls overhanging the lake. All are brightly reflected in the water and it looks as if the lake is a glow with its own light. After the gun signal booms, the float is also illuminated with strings of coloured electric bulbs, banks of fluorescent tubes and a blaze of flood lights turning the ornamental raft into a dazzling sight. Soon afterwards, a display of fireworks starts on the shore and an answering boquet of red and green flares soars up from the central island. Another gun signal booms and the float begins to move. The water ripples and the reflections of coloured lights form ever changing patterns. As the raft makes its slow round of the lake, the fireworks continue and the people cheer and fold their hands in prayer to the deities. 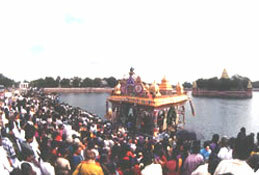 After completing a full round, the float is brought to the shore and the divine idols are taken out with great ceremony. Then follows the enactment of scenes from the legend relating to the deities. Finally, the idols are mounted on a beautifully decorated golden horse and return to the main temple in a great procession. This float festival attracts large number of tourists and visitors and the entire city wears a festive appearence. Brought from the Vagai through an ingenious system of underground Channels. King Thirumalai Nayak born in 'Poosa' Star. so in commemorating the birth of the king, Float festival is conducted in Tamil Month 'Thai' (Jan/Feb) in the tank in a colourful way, which attracts thousands of tourists.